It's always difficult comparing a sequel's soundtrack to the original film. Almost always, such a comparison suffers. Why? In The Lion, The Witch, And The Wardrobe, composer Harry Gregson-Williams introduced us to this enchanted land. The themes were complete, melodic and told a story in their own right, as should happen in an introductory film of a series. Prince Caspian, both the film and the soundtrack, presumes that backstory and sets us directly into a world of forgotten faith and slavery. When our heroes arrive to help Caspian, there are hints of the melodic themes of a glorious past age, but only hints. Mostly there is brooding melancholy over the necessity of battle against evil oppression and loss of faith, but once joined, the score takes on a fierceness that superbly challenges the ears with the same passion with which Lewis' words and Andrew Adamson's film assaults our eyes. I choose those words carefully because the music is designed to capture the listener and present him or her with a choice: to stand with the good in the battle against evil or to walk off in despair into the darkness. Not only that, but the haunting hope that dances around the fringes of the music makes one long for the truth of a faith once learned in childhood and perhaps lost in maturity. 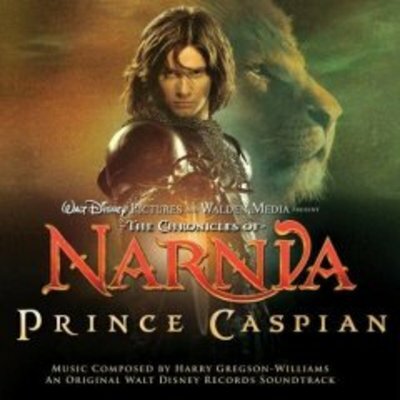 The music of Prince Caspian asks us to recapture the truth of that faith and bring it into adulthood. This is a beautiful soundtrack, heroic and martial. In many ways it is comparable to John Williams' The Empire Strikes Back score. The use of the choir is superior to TLWW, and Aslan's Theme comes forward to bring a hope that no one thought was possible. Additional music brings a contemporary take on the same themes and should be welcomed by a younger audience.